Purchasing the Vision treadmill TF40 Elegant, you get an equipment of high-quality workmanship offering a joint-gentle workout thanks to its good absorption features and convincing regarding safety. 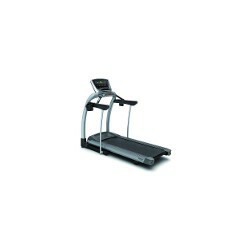 The Vision treadmill TF40 Elegant offers 15 varied workout programs in total. Two integrated Virtual-Active programs showing real-shot tours across Chicago and the Swiss Alpes. A stable frame construction in combination with powerful components and an innovative touchscreen user surface are characteristics of the Vision treadmill TF40 Touch and make the equipment an ideal and durable workout partner for home and semi-professional use. The Touch console has a touch-sensitive 15.6" LCD monitor with integrated workout calendar. The Vision treadmill TF40 Touch provides 19 programs in total for individual exercises. Two integrated Virtual-Active programs allow to run real-shot tous in America's Northest or in Northern Rocky Mountains. 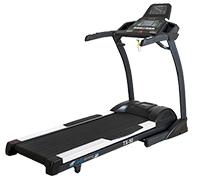 Sturdy, reliable, and comfortable - The Vision treadmill TF20 Classic is characterized by a solid frame construction, high-quality continuous output motors, and shock absorption systems as well as an easy operation. Create a varied and entertaining workout with 5 training programs. Connect the optionally available Passport Box with multi media functions for even more fun and motivation. The Vision treadmill TF20 Elegant of high-quality workmanship offers many motivating training options with its video function and 15 varied programs. Besides four heart-rate controlled programs, the Elegant console offers already two pre-installed Virtual Active videos showing real-shot training tours across Chicago and Swiss Alpes. The Vision treadmill T60 is an ideal partner for a safe and effective stamina and interval training. It is suitable for homeuse as well as semi-professional use. 9 workout programs offer a varied training. The treadmill is equipped with an extra large running surface and a maintenance-free, pre-waxed running mat. The digital motor drive system with integrated cooling guarantees continuous, strong, and precise motor power. The control via touchscreen makes the Vision treadmill TF20 Touch the Premium model of the series TF20 of Vision Fitness. With a total of 19 workout programs, the treadmill of high-quality workmanship offers optimal conditions for an individual and target-oriented training. The console of the Vision treadmill TF20 informs about your performance data and you can watch Virtual-Active videos and exercise on real-shot tours. Two tours (Northern Rockies/America's Northeast) are already pre-installed. 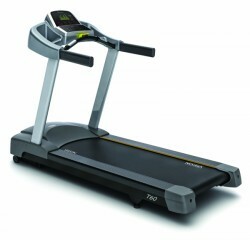 Purchasing the Vision treadmill TF40 Classic, you get a treadmill of high quality for home or semi-professional use. 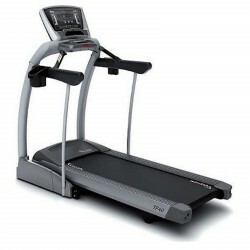 The treadmill is characterized by its high-quality workmanship, good absorption features, and guarantees a safe workout. TheClassic console offers 5 workout programs for individual exercises. You can choose between several Vision treadmills: almost each treadmill of the series can be combined with a number of different consoles (Simple, Deluxe, Premium), whereat each includes a different equipment. Find the treadmill which fulfills your needs - independent of whether you prefer a minimalist training without distractions or if you want to be informed about all details of your training! Treadmills are a first-class alternative for walking or jogging. Being independent of the weather, you exercise with a Vision treadmill at home - at all times. You can change speed and incline of modern treadmills, so that a training close to reality is made possible. The production of Vision treadmills attaches great importance to the durability of materials. Therefore, some treadmills are even suitable for use as commercial treadmill, i. e. the Vision treadmill T9700. Furthermore, you can combine most of the Vision treadmills with a console you prefer. You get your customized treadmill!